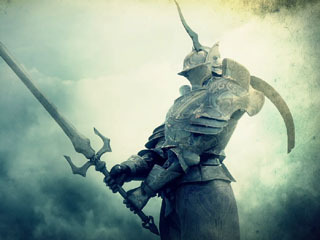 Penetrator is a Boss in Demon Souls. Knight-like demon, the Penetrator wields a long Penetrating Sword that glows light blue during every blow. It can perform a devastating thrust attack, but it's rather slow as the rest of his offensive maneuvers. Penetrator has a pretty large sword and uses sweeping attacks. The pillars in his room offer no protection as Penetrator's attacks will destroy them. As his name hints, his sword attacks penetrate, so you will still take partial damage even if blocking with a 100% protection shield. Luckily, his attacks are all reasonably slow, and he's not particularly fast. You can also roll through all of his attacks and take no damage. Just avoid the "penetrating" attack (His sword starts to glow like the Tower Knight's Ranged Attack) that he used to kill that Fat Official. Most likely you will die (without Second Chance). Also be aware that he can hit multiple people with this attack at the same time, so try to roll away from other players when his sword starts to glow. The best tactic is to walk around the room firing arrows or Soul Arrow (use Homing Soul Arrow if you have it; Firestorm will do a hefty amount of damage as well), rolling through any of his swipes. He moves so slowly you can easily use one of the many herbs you received from the knights on the way in (the best time to use a herb is when he starts an attack which you are already out of range of). You can successfully melee Penetrator, but you need patience, a good shield, and lots of grass won't hurt. The grass shouldn't be a problem, as they are dropped by almost every enemy in the level. The trick is to keep moving and keep your shield up. Try to stay out of range of his sweeping attacks. Some will probably hit you. When they do, back way off and pop some herbs before he gets close again. Always try to stay in a big open area - don't let him back you up against a wall or into a corner. Watch for his sword to glow for the stabbing attack. When you see this, be sure you are moving sideways, and try to stay back. He will always miss as long as you stay moving at a safe distance. This is the key - only attack him right after he makes the stabbing attack. It you try to hit him after any other attack, there is a chance he will quickly switch to the stabbing attack (usually fatal) and you will be too close to get out of the way. Hit him once if you have a slow weapon ( this was done with the Meat Cleaver ), maybe more if your weapon is fast. He'll probably hit you with a weaker attack before you can get away. Back off, take some grass, and keep guarding until he tries the stabbing attack again. This takes a while but it will work. Using a spear/heavy shield combination makes the fight pretty doable, too. While avoiding being backed into a wall, like before, you'll want to bob and weave in and out of his range to bait an attack, and once he misses one, do an R2 attack (lunging forward). With the range of, say, the Winged Spear (which you should've upgraded by now if you're using it), it's not hard to hit him after he's swept the air in front of you. Much like the Blue-eyed/Red-eyed Knights, Penetrator will flinch if he's hit after certain attacks, but not after certain others. The attack to look out for if you want to play it safe, is the one where he sweeps his sword horizontally. If he sweeps his sword diagonally, he seems to be more likely to follow up with an attack that he can't be flinched out of with the spear's R2. Working with the spear's range, his stabbing attack isn't a huge threat as long as you watch out for it. When you see him charge, simply back away while strafing. Roll to the side just before he stabs if you're feeling uncertain… It's a straightforward stab, after all, with plenty of charging time. Another way to do it with a spear and shield is to bait his forward lunging sweeping attack by staying just out of range of his other attacks. When you see him start the attack, back up a bit while moving sideways, and then move sideways and slightly forward, and you can actually be inside the visible attack arc without taking damage. At that point you will be in range to hit him with a simple R1 attack (at least with a winged spear). You will have plenty of time to move out of the way of his followup attack by simple walking. Mostly he will followup with the charged penetration attack, and if you move to just the right distance he will start another forward lunging attack immediately. This takes some practice with timing and movement patterns, but makes for really easy kills with melee oriented characters. Sometimes you may take a blocked hit from one of his swings (some of which do damage through your shield) if you make a mistake, to offset this wear a regenerating ring. You should never need to slow down by using grass. Penetrator has been seen on occasion to attack white phantoms (i.e players you cannot interact with). If you see him exhibiting this behaviour, feel free to take advantage and plant your Meat Cleaver in his back. This white phantom turns out to be Biorr of the other realm, you can see the white phantom holding a great sword and a crossbow. Fire Spray makes this a fun fight. Lock on, hold down R1, and just walk backwards making a big circle around the room. If you've found Biorr, his help will be invaluable. A few swings of his sword, and the foul demon will be defeated. If you time things right, it is possible to defeat him in two casts of Firestorm. Have it ready before you enter the fog. First thing he typically does is charge you and perform a swinging attack, dodge under the attack, end up right behind him, cast Firestorm and run. Use the next minute or two eating spice to get firestorm ready to cast again. Try to get some real distance between you two again so that he starts running at you. When he runs, chances are that he'll do another swinging attack. Once again, roll under the attack, end up behind him, and cast. These two casts are usually enough to bring him down, but you can always melee or cast a third time in the even that it doesn't. The Penetrator can be quite a challenging boss in later playthroughs. Meleeing requires a lot of skill and patience so if you want to kill him safely, use Soul Ray; it is the one of the fastest projectiles in the game. It is possible to beat him with a Magic stat below 20 but it will take much more time. Wear light armor to dodge his attacks or this strategy will be nearly impossible to do. Your chances at using Soul Ray will be when he's either far away and walking slowly or running at you. If he's running at you'll have a chance to stagger him, but it won't do anything if he's already in his attack motion. Be aware of the range his sword has at all times and avoid casting when inside his range. Penetrator's sword can be found earlier in 1-3, although it doesn't glow or deal magic damage. Ostrava implies that the Penetrator was once Metas, Knight of the Lance, one of King Allant XII's circle of elite knights. Penetrator shares a boss theme with the Tower Knight. dude, how I wish I had his armor in the game, she&apos;s so awesome !! !